The end of our cycling season is always a time of reflection and here are some of the experiences that bubbled up for us in that process. Tunisia had the most exotic look during our 2008 season. Our 2008 touring season was a great year, but so was 2007, 2006, and all the rest. Bill sweats bullets over the route and is always working on general itineraries for the coming 2 years and then agonizes over the final details as the season unfolds. 2008 started in the early spring with a non-biking excursion to Tunisia. Tunisia was one of those places we didn't exactly love while we were there but are very glad to have made the visit. It was a bit edgier destination for us than Europe and our experiences there will be reference points for years to come. Next came Sicily, which we loved. We didn't love every inch of our tour of Sicily, but it won top marks for an overall cyclotouring experience. We darted from Sicily to Barcelona by boat to spend about 6 weeks meandering through the Pyrenees. The Pyrenees fell somewhere in the middle ground: glad to have seen them but don't need to rush back. The Italian Dolomites deliver what we want from a mountain experience both for cycling and hiking and we'd hoped that the Pyrenees would expand our options but they fell short. We now know to meet our mountain needs in the Dolomites and leave it at that. We wrapped up the last big segment of the year by again meandering south along the coast of Croatia, which always delights us with distinctive Mediterranean scenery and relatively warmer weather as the late fall descends upon Europe in earnest. Our usual aggravations from critters when traveling are snapping dogs and biting mosquitoes and both of these players were again nuisances in 2008, though the list of uninvited guests got longer as the year progressed. Our titanium walking sticks were kept ready for deflecting dogs. 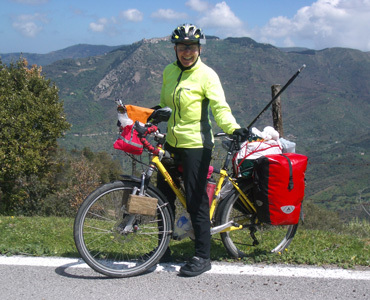 Aggressive rural yard dogs in Sicily pushed us into modifying the storage position of our telescoping walking sticks on the bikes so they were ready clubs with which to 'bark' back at charging dogs. Unexpectedly, Bill had to swing his titanium club again on Col d'Aspin, a part of the Tour de France route. But by the end of 2008, the a score was still 0-0 between the dogs and us with neither side ever making significant contact in our 8 years of travel. The mosquitoes however always are the leading scorers and we occasionally resort to plugging in our "bugger," a little device that emits fumes from chemically laced tablets, hoping the chemicals are more toxic to them than to us. In 2008 louder alarm bells went off twice in regards to mosquitoes as it was the year that we became more knowledgeable about the Aedes albopictus mosquito, also known as the Asian tiger mosquito. This delicate, inept flyer was first getting our attention in March when we were in Tunisia where dengue fever is carried by these gals. Dengue is a disease you don't want to get and we arrived with permethrin saturated clothes, 2 bottles of potent repellent not available in the US, and our plug-in bugger. While in Tunisia we never spotted the dreaded mosquito and didn't need to wield our defensive supplies. The bigger surprise was in early October when I spotted one of these striped-legged biters pausing on my shirt while in our room. The white striping on her back legs was remarkably distinct on my black fleece shirt and I ran for the repellent spray. Dengue wasn't a risk where we were in Udine, Italy but Chikungunya was. It's a viral disease with painful symptoms similar to those of dengue and is carried by the same mosquito. There was an outbreak of Chikungunya in Ravenna, Italy in 2007--not far from Udine--so we'd been alert to the risk. Oh, and then there was that scorpion on the wall of our upscale, though ground floor, B&B in Sicily. Like other slow moving pests, we were easily able to relocate the guy by inverting a drinking glass over him and carefully sliding a stiff piece of paper under him. With steady hands and watchful eyes, he was carried outdoors and released from his temporary cage. The mouse scurrying across our bed just before we hopped in was a new and alarming problem. Unlike the scorpion, speed was his strong suit and we remembered from pest control problems as home owners that mice can slip through openings as small as 1/4". As we chased him around the soft covers and pillows, it became clear we couldn't match his speed or stealth and yet he was a totally unacceptable bedfellow. I often get the "Action Hero" award for quick problem solving in these situations, but Bill took the prize this night. And thank goodness, as I was baffled as to what to do. Under Bill's guidance we carefully removed the pillows, clothes, and books from the bed leaving only the single pair of pants we knew he was hiding under. Then in unison, we gathered up the corners of the bedspread and Bill dashed out onto the terrace of our Opatija, Croatia B&B. The mouse flew out of the fabric as Bill released the corners and both he and the mouse headed for the door. I doubt that the mouse really wanted to be back in the room with us but the sound of the nearby cat fight probably made it seem the better choice. An uninvited lunch time guest in Croatia. Luckily for us we were able to keep him out. Had this been our first instead of our second night in the room I might have been taunted by dreams of mice scrambling over my pillow for hours. But we were fairly confident that he was on a scouting mission and not part of a pack because of the absence of mouse droppings. Then there was that snake that slithered in to share our picnic area one day in southern Croatia. Fortunately we were dining on a bench instead of the nearby rock wall that seemed to be one of his hide-outs. And I was oh-so-relieved to have spotted him before stepping on him. We weren't able to determine if he was one of the poisonous species in the area but we both settled for peeing on asphalt instead of going into the bushes as usual after seeing our uninvited lunch buddy. I hadn't remembered 2008 as a particularly hot and sunny year but inspecting my gear at year-end told a different story. As every year, the sun fading on my protective shirts created decidedly unattractive patterns of patches and streaks and the stitching on my dark green pants turned a odd brown as had happened the previous year. 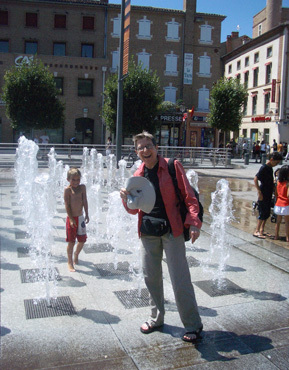 Edging closer to the fountain to cool off in France. But even my black backpack had fade marks as did a 2 year old wind breaker. Most surprising however were the dark gray tones on the straps of my black sandals. Both my Shimano cycling sandals and Chaco walkers had odd, deep, reddish or gray hues displacing the solid black color they began the year with. Undisputedly, we'd been exposed to a lot of UV this year, both on and off the bike. We did remember some sizzling days, like around Agrigento, Sicily and hitting the plains in France when we dropped out of the Pyrenees. I waded in a creek and contemplated a dash through a city fountain to cool off but that French hot spell, like all the others, was truncated by a rain storm. The refinements to our gear get smaller and smaller with each year of travel and 2008 reflected a continuation of the trend. Ingesting fewer solubilized plastics became a new goal, so we each replaced a plastic water bottle with a stainless steel one. Our Kleen Kanteen's were noticeably heavier than the disposable-grade bottles they replaced but with each sip we were reassured by having made the switch. A stainless steel cup soon followed to reduce our reliance on our durable plastic one. And despite the weight penalty, we'll buy another 1 or 2 stainless steel bottles for 2009 for our olive oil and perhaps other beverages. 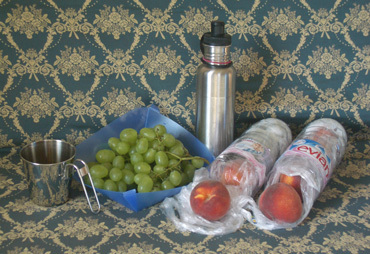 New food & beverage containers for 2008. We did however add a little plastic to our kitchen supplies but presumably it didn't add to our plastic ingestion. Too many years too late, we finally discovered that straight-sided, 1.5 liter water bottles with their heads lopped off were the perfect solution for transporting round fruit without damaging it. Given that the idea struck in Italy during peach season, they were given the name "Tubo de pesce" or "peach tubes." Tomatoes, pears, apples, and other bulbous fruits traveled well in them too. In 2008 Bill treated and burdened himself with a chain measuring tool. In the past he'd decided against carrying one of these expensive ($35) and delicate little tools and opted instead to replace our bike chains on a mileage schedule. But after devising a way to carry the tool with minimal risk of damage, 2008 was the year to give one a try. 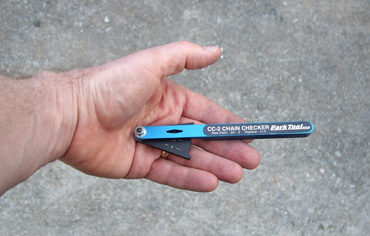 Bill's newest cost-saving effort: a chain measuring tool. Surprisingly, the simple device paid for itself several times over in the first year. Even given that we usually bring a pair of better-priced chains from home, Bill estimated that he would have bought 3 chains at the European price of about 35€ or $50 each. Despite our heavy loads, our chains were lasting far longer than Bill expected. And checking the chain length is a quick and simple process compared with actually changing a chain. Another unexpected finding with the chain measuring tool was that I was harder on my chain than he was on his. Bill's extra body weight, his sometimes heavier loads, and his generally rougher riding style invariably means his bike gear wears faster than mine, but no so with the chains. His best guess was that his cultivated habit of riding out of the saddle (in a standing position) for more than 25% of the riding time was making the difference. He pedals at a slower cadence (lower RPMs) than I in general and that difference is exaggerated when he is out of the saddle. Apparently fewer spins of the chain is more sparing of it than less force or weight. OJ boxes became mini front panniers in '08. 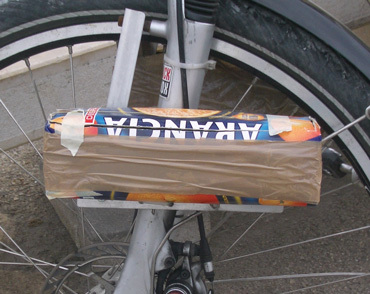 One of our little enhancements for 2008 was making disposable, lightweight 'panniers' for Bill's handcrafted, mini front racks out of 1 liter OJ boxes. Light, inexpensive items like packets of tissues that are hard to buy less than 10 at a time found their way forward into these. Our new model of Schwable tires (Marathon Supreme) delivered another flat-free year though they developed worrisome sidewall cracks in their first months of use. 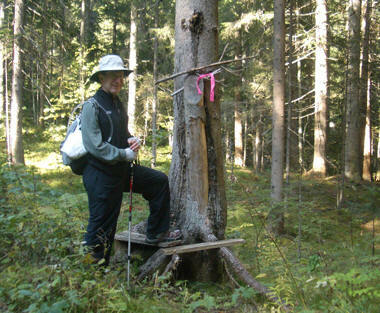 A couple of potentially dangerous hiking situations in 2007 had us carrying pink safety tape to mark our way in 2008. We didn't use it much, but will continue to carry it when hiking and on the bike. It's a way for us to find our way back when scouting a poorly trod trail (like through a hillside pasture) or to signal an unlikely detour if we are cycling out of sight of each other. Retrieving a pink trail marker we hung in the tree. And Bill boldly switched from his stiff, heavy, highly-engineered, high-top hiking boots to more agile 'approach' shoes for hiking while in Spain. He discovered that the need for protecting the ankle against twisting was actually greater in ankle protecting boots than those that left the ankle free as the bulkier boots made him more prone to stumbling. He was so pleased with his approach shoes and was desperate to shed more weight so he sent home his Chaco sandals in July and used his find as his only footwear for the rest of the season. Our Baby is going to have a Little Brother! Little Brother was conceived in September and after a short gestation, is expected to be delivered in December or early January. "The Baby" is the name for which ever laptop we have at the moment and so far we are on #3 in 7 years. "Little Brother" is the new 9" screen sidekick that will be added to our electronics family this winter. Ever since adding a laptop to our load in 2002 we've wished we had 2. There is always more to do and we always felt like we were in a 'take a number' line as we each jockeyed for a turn. But the expense, weight, volume, and additional headaches of a second laptop had us again and again deciding against buying and instead being more efficient in our shared use of our one and only. In prior years that meant swapping every hour in the evenings to keep our productivity high. This year we added the strategy of splitting up for separate activities on layover days so the laptop was in almost continuous use. The 3 different hardware problems that developed mid-season this year on our new laptop was what raised the Little Brother issue once again. We'd had 'send it in for repair' level computer problems an average of every other year since we began our travels and our reliance on the computer was of course increasing annually. The updating of our webpage and viewing and culling photos were early dependencies on the laptop. Over the years things like dictionaries, encyclopedias, and viewing educational DVD's became treasured uses. And this year Bill's success in giving us reliable internet access in some countries via his special cell phone connected to our laptop heightened the value of the computer even more. The laptop had slowly been moving from being a luxury to a necessity. The lesson learned: if when traveling you really, really need a computer, then you need two as internet shops often aren't available when you need them. A white towel folded to the same size as "Little Brother." As is often the case with change, our decision to cave-in to the advantages of a second computer came about because of several coinciding events. Bill had noticed that a new mini laptop with the right mix of features was available about the time we started having serious crashing problems with The Baby. And then weeks later Lonely Planet at last announced that downloadable versions of their European guides were now available. Bill had been waiting for that announcement for years as at times he carries 5 lbs or more in guide books. Suddenly the balance tipped and Little Brother's time had come. The price of the mini was low enough to be compelling: under $800 when the decision was made, under $500 when it was purchased. We use Microsoft software for our existing laptop but buying a full 'suit' of software for the little guy would cost more than his sticker price so Bill decided to try Sun Microsystems OpenOffice.org Writer free software. He downloaded the software in September in hopes of resolving the compatibility issues ahead of Bro's arrival, but of course our laptop became completely comatose before he had a chance to access the problems. The volume and weight premium of the new mini would be cancelled out by eliminating our considerable library of guide books. The electronic versions will have their downsides, but those were problems we looked forward to solving. More than once we've made special trips into major cities like Venice or Prague for the sole purpose of buying guide books. Sometimes a sudden change in route leaves us settling for a guide written in Italian or French, which decreases the utility for us. Additionally, we are forced to toss out almost all the guides that we buy in a year because we can't carry the entire collection we would accumulate. We don't need to have the latest edition for most countries, so the total number of guides we buy in a year will plummet. And ironically, the reliance on the electronic versions of guide books will make having a back-up computer even more urgent. So, suddenly the year's old weight, volume, and price complaints about buying a second laptop were history. Now the wildcard is how much troubleshooting time the little guy will demand from Bill. 2008 will be remembered as the year in which more time was spent making the new laptop and the new software functional than actually using it as a tool, hopefully we won't see a repeat in 2009 with either laptop. If you have any advice about using Sun's software, especially regarding its compatibility with Microsoft's, we'd love to hear from you. When buying a replacement digital camera, if at all possible, take paired photos with your new and old camera before heading off on a trip with the newcomer. We bought a camera in the States and had it mailed to us after our old-standby camera jammed. Fortunately we were able to coax the old camera into working again and on a lark decided to take paired photos with the old and new camera expecting to reveal subtle differences between the two. We thoroughly expected the new camera's superiority to be shown in almost every way and hoped to speed our learning curve on the new camera. After taking hundreds of photos, Bill mailed the new camera back as the photos were uniformly terrible. Bill's guess was that the light sensor was malfunctioning as many photos had too much yellow, most were blurred or had poor resolution, and it frequently overexposed photos. We've worked hard at learning to take good photos and on our 5 year old camera almost every photo was good enough to be a 'keeper' whereas none of the photos on the new camera were up to our standards. GPS was the big new boy-toy for 2008 and it was definitely a 'keeper'. Having said that, it appears that the active learning curve for GPS is about 1 year, so don't head out on a journey heavily relying on 'learning as you go' as a newcomer to the technology. Bill's many problems were compounded by glitches in the software that the manufacturer was slow to fix, including glitches that frequently crashed the system and ruthlessly drained the batteries. Additionally, software maps weren't always available when Bill shopped for them; the night time setting was unusable, which Bill only discovered when we were desperate in the dark in a downpour; getting the right scale set so it was accurate when hiking was not straight forward; and on and on. One of Bill's & Gar's many private moments. But regardless of its crankiness and the challenges of learning to use it, the Garmin product was quickly nicknamed "Gar" and he was like a new traveling companion. We'd have to stop and wait for Bill to revive Gar when he crashed or stop to consult him like a ouija board when the twists and turns in the road became too confusing. 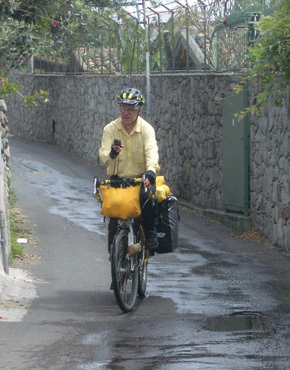 Using GPS allowed Bill to route us onto quieter roads that weren't well documented on the maps, especially in Sicily. The system also cut down on the number of maps purchased and carried in the year. Cold weather saps the batteries on electronics like GPS, cell phones, and digital cameras, so as our reliance on these devices increases, we are also having to anticipate performance degradation and carry extra batteries, especially on hikes where the weather can suddenly turn for the worse. I always imagine that many more people are curious about our money matters than ever find a way to ask, so here are a few details. The end of our 2007 traveling season had us looking at continuing our travels into Year 8 on the weakest dollar since we began traveling. We were overseas when the Euro was introduced in 2002 at the delicious rate around .85€=$1; by the end of 2007 we were looking at 1€=$1.47. September 2008 produced a gut wrenching 1€=$1.60. The good news in the global financial crisis was that the dollar ultimately strengthened, achieving a 19 month high to the Euro by October 21 of 1€=$1.30 and a few days later the dollar strengthened by another nickel. We didn't confine ourselves to a tighter budget in 2008 because of the weaker dollar but did keep it in mind. We did effect some budget relief by tumbling into new lodging options this year which overall improvement the quality of our stays and while decreasing the average price. 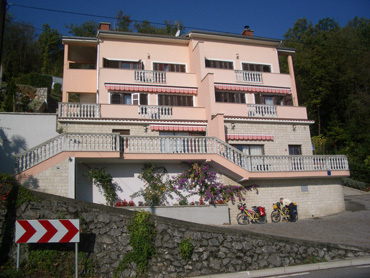 Vila Ana in Opajita is typical of the better private lodging in Croatia. Early in our season Bill was able to tap into the new flock of EU-funded B&B's in Sicily, which were delightful finds. It was combining his new laptop-cell phone link to the internet for tracking down these abodes that primarily advertise online that gave us access to them. 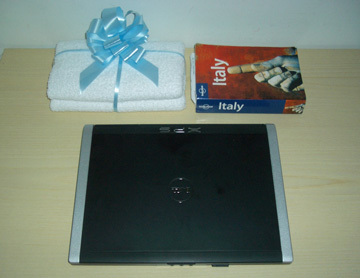 Having his new GPS, his new Euro cell phone, and growing ability to speak Italian on the phone made this a viable option--one that gave us higher quality lodging at a moderate, consistent (fixed??) prices. Months later we set out to crack the code on finding the nice but deeply discounted private rooms and apartments in Croatia. As hoped, in what was probably our 4th visit to the country, we were in a stronger position to figure it out. Suddenly we were staying in lovely places night after night for $45-55 (about 30-40€) a night, and occasionally even less. All of our assets are in the market so as it goes, so goes our wealth. As the market crashed in the fall we were left to guess that our assesses were shrinking in tandem. Lacking the security of checking our accounts with our own computer, we chose not to check our accounts at internet shops. Being in the market is like riding a bike: it takes trust and courage, so we pressed on with both. Bill had held out more cash from the spring sale of our house than he would normally, which in hindsight looked inspired. Losses on stocks aren't certain losses until you sell and having sufficient cash on hand meant we weren't forced into sealing the deal on the losses by selling. What's left of the house that slid & a house it hit on the way. Speaking of selling our house.... The timing of that decision wasn't optimal when it was made last fall because of the tax consequences, but that all changed. Since selling it in the spring of 2008, the housing market and credit markets slid into oblivion, which made moving our house when we did suddenly look like a savvy decision. 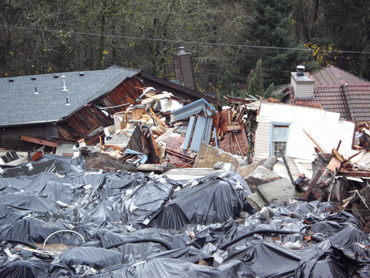 In addition, a hillside house less than a half mile from our hillside house literally slid away in October, along with all the land under it. A half dozen other houses were damaged in its path with insurance coverage for all being in question. If the real estate and financial markets slides wouldn't have sunk a later sale of our house, this event surely would have scared away buyers. Whew! All of Bill's pre-work for cell phone connection to the internet paid off and we used it extensively while in Italy during the sale of our house. That business transaction would have been a nightmare without that option--an option we later discovered that we couldn't buy in France. We felt extremely lucky to have our house sell promptly so that our itinerary wasn't wrapped around the cell phone services of particular countries. "What are you going to do for the webpage this year that is different?" is a question Bill asks each year. 2008 was like most years: I didn't have an answer at the beginning of the year but I did at the end. This year I did a couple of new things. 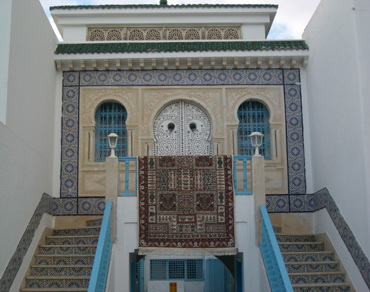 With our first major event, which was visiting Tunisia, we created our first separate photo gallery file linked to a journal. For Tunisia we tacked on 3 photo galleries and for Sicily we did a few more. I was pleased to have a new format for sharing quick to view, themed photo albums which allowed us to show more of what we saw without bogging down the webpage. For the first (and perhaps the last) time I kept what was essentially a daily route diary for our tour of the Pyrenees with both biking and hiking information. We had little luck in finding route planning information for the area and hope our notes will be of service to some cyclotourist out there in need of opinions. Rather than being a good read, it was intended to be a reference--one that we too will use if we return to the area. Something else that was new for 2008 that I hope not to repeat again, was keying in most of the text for our last 4 journals of the year and several Sidetrip files on the thumb board of my PDA. Our laptop went belly-up so thumbing was Plan B. Bill's big challenge for the 2008 webpage was the conversion of all the past files to the new format for the new Vista and Expressions software than came with the new laptop. (Yes, the same one that irretrievably crashed after 7 months on the road). Bill spent months making the needed changes to about 100 files but at least it is done. That's our look back at 2008. Bill said this is his favorite journal of the year to read as by year-end so many of the events have blurred with prior years--this brings them back on the right place on his timeline. I hope you enjoyed the look-back and will come along for next year's ride too. We are wrapping up our tour of coastal Montenegro at the most southern city of Ulcinj. It is a more pleasing town than most we have seen in Montenegro and our $33/night apartment is a steal, so we are laying over a few nights. The unfinished 2008 webpage backlog caused by our computer crash has been weighing heavily upon us and trip planning in Montenegro has been harder than expected, so we've called a "time-out." Additionally, trip planning for our upcoming time in Italy has been complicated by the 10,000 earthquake victims lodged in the region's tourist hotels, so our chore list has felt out of hand. Once caught-up and underway again, we'll hop a train to get deeper into inland Montenegro without terrifying ourselves in the intense truck traffic. There we hope to find some quite roads and perhaps some parts of Montenegro that aren't being transformed in hopes of a tourism boom. Then it will be a ferry to Bari, Italy. From there we'll make our way (somehow) to Pisa. Pisa will be our departure point for a 10 day trip in mid-May, without the bikes, to Malta where we'll meet up with a friend. Then it's on the the Dolomites in July.